Find Samuel Tells of the Baby Jesus, Chorus, Part 1 HERE. You can find how I taught the actual verses HERE. If you need more information on handbells, how to use them and where I bought mine, check out my Using Handbells in Primary post HERE. We're going to be singing Samuel Tells of the Baby Jesus as one of our musical numbers (Christmas Bells will be our other one - if you want details on that one, find it HERE as I did it last year). I thought it would be fun to use the bells on the chorus of this song. 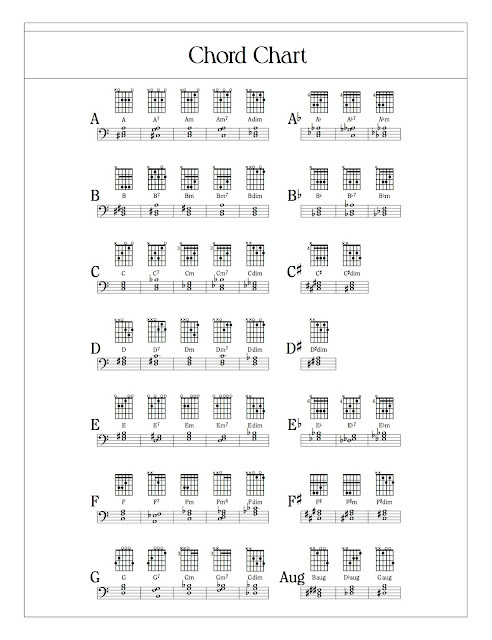 Because there is no obligato or descant for this song, I'm going to try to use the guitar chords that are referenced in the music. 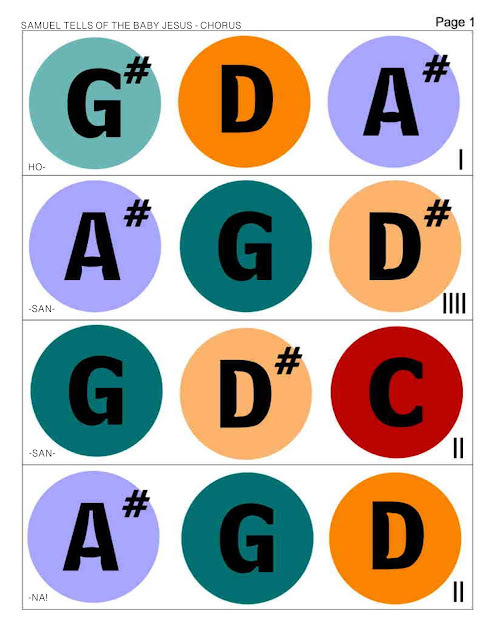 For more details on using chording with handbells, check out my post HERE. This note-chart is for the chorus only. Download my chart HERE. Check out all of my handbell posts HERE for more! Also, there is a way you can make any document you create into a pdf. There is a free program you can download that installs as a printer. When you go to print you choose it as your printer and it will save it as a pdf. I have used it for years and it works great. It is called CutePDF. Here is the link: http://www.cutepdf.com/products/cutepdf/writer.asp. Don't forget to also install Ghostscript. In the instructions it gives you a link. Thanks Lisa...I'll look into getting these into PDF so I can post them online. I'm slowly learning. 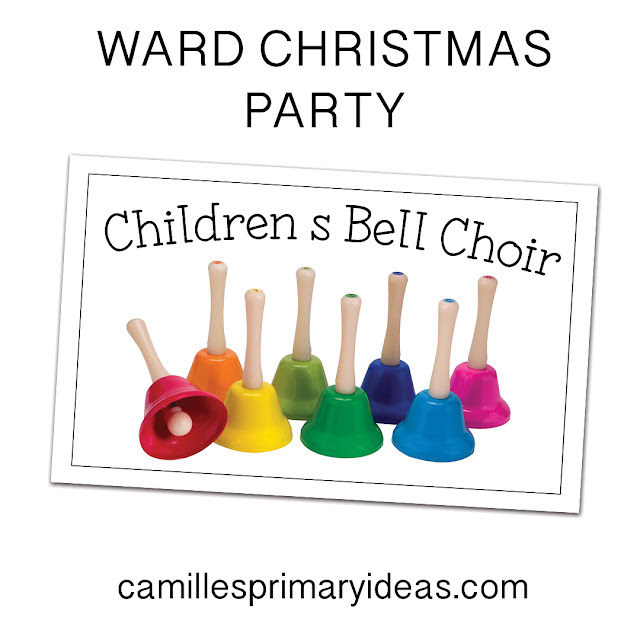 As for ringing the bells, I have the kids hold them against their shoulder when not being used then they move their arm forward and ring the bell once. On occasion, at the end note, I'll let everyone shake but it gets to be too crazy if everyone shakes a few times when their bell is to be played. Thanks for the answer. That's how I was planning on doing it (got the bells this week) but I read on a different blog that they let the kids shake them and was curious what you did. CutePDF is really easy to install. Just download both programs (I noticed that both are on the left side of the link I gave you) and follow installation instructions. It really does just show up as one of your printers. Choose it as the printer, click print in whatever program you are in and a screen will pop up asking where you want to save it. You can even "print" it in black and white or color. I have used it hundreds of times and it always worked great. But now I've switched to a Mac computer (using it for about a year now) and pdf is included as one of my print options so I no longer have to use CutePDF. When I had a stake calling CutePDF came to my rescue because I had to email so many flyers to other wards that I made in a program like your scrapbooking one. I want to add a testimonial to Camille's suggestion. We bought this 20-bell set for use in our primary and the kids just love them. We had them play the bells for Stars were Gleaming and Silent Night for our Christmas program. The kids had a lot of fun and the ward members loved it. Just curious....how did the chords work out for you? I have been wanting to try this, but I would love to get some input. I thought maybe I would just do the melody and alto together. Any thoughts? The chords were fun - the older kids really enjoyed the challenge! The little kids, well, they were just excited that more bells got to play more often :) but I never expect the bells to be perfect with them. I hope that helps some. Carmilla, I love the bell charts, Have don't see link to down load the samual tell of Baby Jesus. for the Bell chart. I've updated the post so you can download the files. Thanks! !